Every time I whip out my elephant-covered reusable grocery bag at my local Brooklyn Key Food, I always feel a little bougie. I—and I’d say most people of color—tend to view these items as something that, well, the white elite use. So when the topic of plastic bag bans comes up, people of color may exhibit some hesitancy, especially if they also happen to be low-income. Plastic bag bans should always be good news though, right? After all, one million new plastic bags are used a minute around the world. That’s a lot of plastic and a lot of garbage—garbage that ends up in our oceans, our landfills, and, ultimately, our soil and water. California’s ban has been wildly successful so far in reducing plastic bag litter. However, there’s an art to crafting these bans in a way that doesn’t add any unnecessary burdens or costs on those struggling the most financially in a community. This brings me to the plastic bag ban that the Providence City Council in Rhode Island approved Thursday night. The city’s Racial and Environmental Justice Committee, which sits underneath the Office of Sustainability, began to voice concerns over the ban once they realized the council was moving quickly to vote on it just a month after the proposed ban was brought to the committee’s attention. The ban, which will take effect in a year, includes a minimum 10 cent fee for customers who don’t bring in their own reusable bags and need to purchase a recyclable or reusable bag from the store as they check out. This is pretty standard across these bans because it encourages customers to bring in their own bags and stop relying on disposable ones. However, the ordinance doesn’t address the ways this might trouble low-income and communities of color. Kuumba wishes the city council would have taken its time with the ban. That way, the city would have been able to meet with the community and find the best possible method. “Providence, Rhode Island, is supposed to be the creative capital, so we thought we’d be able to create something that is equitable for the community, ” he told Earther. The city council is, however, willing to address these concerns in the coming year before the ban takes effect. The council may amend, add, and remove items, or change the ban entirely. Perhaps the ban will end up looking similar to others around the country. For example, the proposed ban New York State senators Liz Krueger and Brad Hoylman introduced last month includes features like exempting WIC and SNAP recipients from the bag fee. 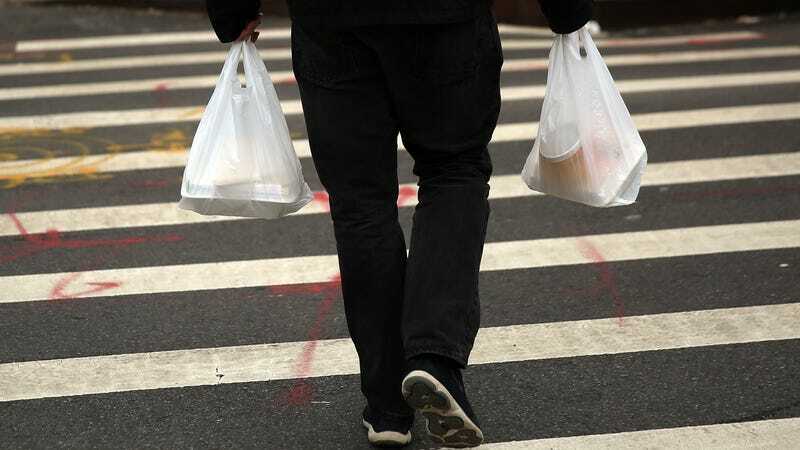 It also plans to tunnel 80 percent of the bag fees to the state Environmental Protection Fund to help with pollution reduction efforts, education, and free reusable bag distribution. The state would prioritize these services in low- and fixed-income communities. The Providence ban, on the other hand, currently leaves all the bag fees with the stores. That’s just one taste of what legislators and advocates have included in plastic bag bans that at least attempt to incorporate equity into their model. In Washington, D.C., for example, the Department of Energy and Environment has partnered with community organizations and stores to give away thousands of bags to low-income and senior residents to address the needs of those who can’t afford to spend money on bags. Kuumba and the committee have been looking at different models to see what would work for Providence, but they’re not supporting any model just yet. They’re leaving that up to their constituents and community to decide. That way, when the ban actually rolls out, no one will be left feeling cheated, forgotten, or unaccounted for. That’s what environmental justice looks like.